Here’s a quintessential Mangalorean recipe that I have somehow missed to post on my very Mangalorean blog. How could I have missed to post this earlier, I wonder. Anyway, better late than never. Actually, I intended to do a post on the Black Chana/Garbanzo beans that we in Mangalore seem to make almost every 2-3 weeks, when I first got my new camera – which was last year. The Chana dish that I had prepared for lunch one day was the first shot in my camera, which I haven’t deleted till date as it brings back the fond memories of such excitement I had that day that I randomly clicked pictures of almost everything in my house. However, since I had not planned a photo shoot that day the dish never made it to the blog. 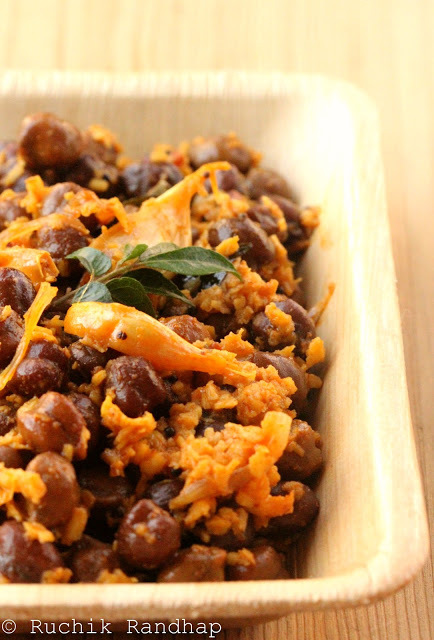 Despite the fact that hubbykins and I are poles apart when it comes to choosing our favourite food (we are never on the same page), I’d have to say that the Black Chana sukka is our favourite. I usually make it at least twice a month and it tastes wonderful with simple boiled rice and a tomato saar (watery soup). My mum used to make it especially on Good Friday and we used to eat it along with Nivole (Spicy curry made of carom seeds (ajwain), roasted coconut & spices) and typical Mangalorean red rice. Yum! was not the word! It is such a beautiful combination that we never missed a non vegetarian side dish to complete the meal. 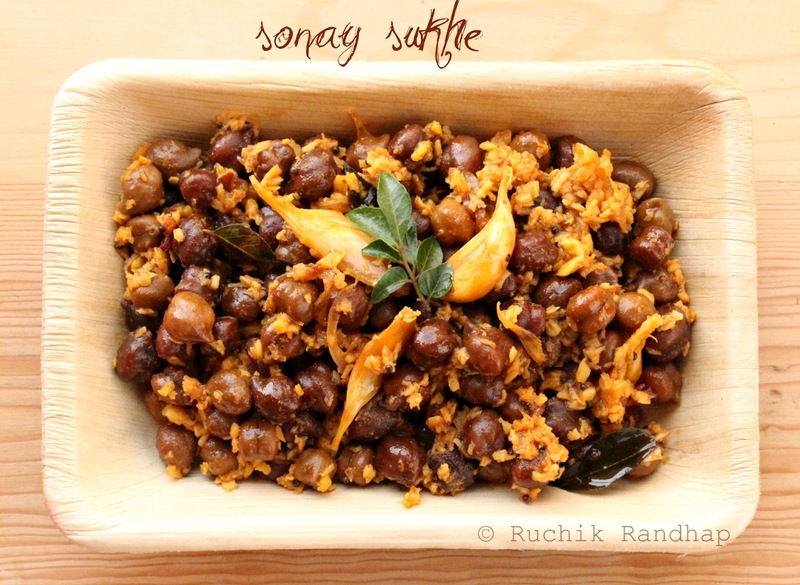 Sonay Sukhe as we call it in Konkani is also part of the festive vegetarian meal (Novein Jowaan) that we have on September 8th – the Nativity of the Blessed Virgin Mary. So this will go into that collection in my recipe index! During that feast, my mum used to add a wee bit of jaggery to the dish to give it a bit of a sweet edge to a moderately spicy dish. However, since the man does not like any sweetness in his savoury dishes, I refrain myself from using any jaggery while preparing it. You can add about 1/2-1 tsp grated jaggery just before you add the pre boiled Chana so it blends well with the masala. Also, since the Novein Jowaan happens during a season of abundance – which is right after the first few showers of the monsoons, we use Hog Plums (Ambado) as the souring agent instead of tamarind or tomato. If its available in the markets when you are ready to make this dish, go right ahead and add a couple of them for the given quantity. The dish tastes awesome! Fugad is just another name for a preparation that involves tempering of ingredients such as mustard, curry leaves, onions & garlic before adding the main ingredient (usually a vegetable) and often includes the addition of grated coconut. This preparation is simply called as ‘Sukka‘ in Mangalore in the local languages, be it Konkani, Kannada, Tulu or Beary Bhashe. 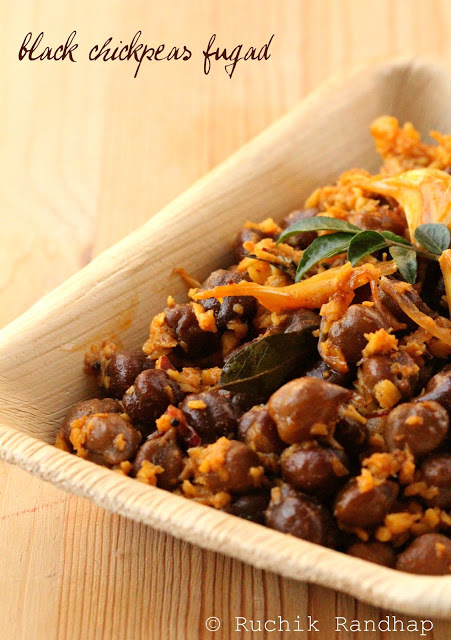 You can try out the same method with many other legumes such as Black Eyed Peas (Chawli) or Chickpeas (Kabuli Chana) or Mung Bean Sprouts (or any other sprouts), String/Runner Beans (Sango in Konkani, Alsande in Kannada), French Beans, Yam (Sooran). The Fugad or Sukka is a cousin of the Keralan vegetarian Thoran. 1. Place the soaked chana in a pressure cooker, add enough water to bring the level upto 1 inch above them. Add salt to taste and cover, place the weight & pressure cook the chana for about 4-5 whistles (or till tender but not mushy). Turn off the flame and allow the cooker to cool. Open, stir and keep aside. 2. In a heavy based kadhai/wok heat some oil and toss in the mustard. When it pops, toss in the curry leaves, garlic and fry for a couple of seconds. 3. Add the sliced onions and fry till golden. Toss in the grated coconut and fry for a minute or two. Add the bafat power and continue to fry on a slow flame to avoid burning of the powder. You may add a bit of the stock from the cooked chana if you think the mixture will burn. 4. 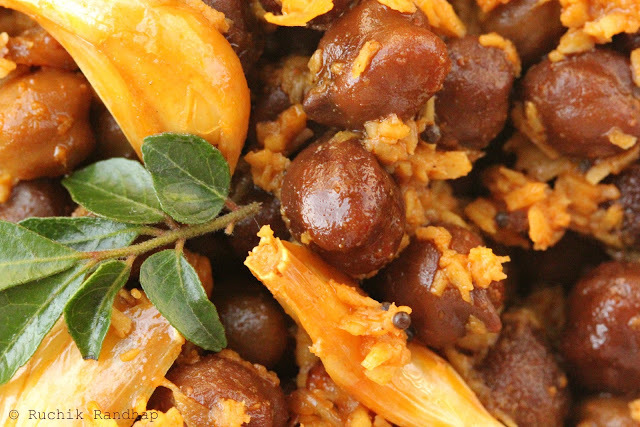 Add the tamarind juice, mix well and lastly add the cooked chana and a little of its stock. Cover and cook on a slow flame till the water has been absorbed and the chana is tender. Very tempting and delicious looking sukhe. I love fried channa and this is a nice variation i can try!!! Looks more like sundal, but the recipe is different. Will definetely try this one, will make a great side dish to any mixed rice. Yes, this authentic Mangalorean veg dish just needed to be here….! keep them coming Shireen! !Awesome pics. I know the pain of extracting proper authentic recipes…So once again I need to really really thank you for all these beautiful recipes…. Thanks for the recipie! Came out really good. This was really easy. I cooked this along with other meat recipes for a party, everyone praised me for this recipie, and were helping themselves with 2 or 3 times . Thank you so much shireen. I am a Mangy too and have had delicious-tasting sonne sukem at village weddings. Sad to say I have never achieved the same result in my kitchen. I hope I will able to make the perfect sonne sukem with your recipe. Thank you! Sorry for the long mail. BTW,the red wine turned out super! !